We offer services in manufacturing, construction and design of wooden stairs, doors and furniture of oak finger. We are working in this field since 1995 for the manufacture of our products, we use eco-friendly materials were dried in a vacuum drying chambers, and adhesives and varnishes highest quality from leading manufacturers from around the world. Internal control on our production guarantees high quality of the output. We execute orders within 2-4 months. 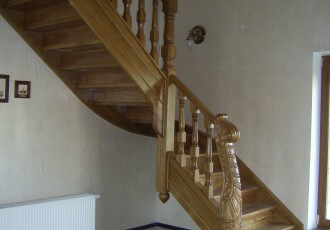 A distinctive alternative to the traditional home design is the use of wooden stairs in a modern style. Depending on your preferences, they can create a light atmosphere, giving up of straight lines and corners, making it more natural, or vice versa they can add solidity. 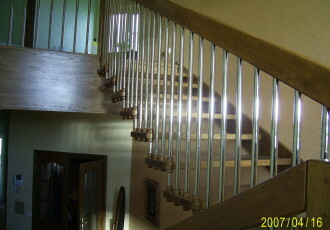 Elegance and original design of stairs in a modern style will satisfied even the most demanding customer. After all, these stairs will become a key element of any interior and will amaze you with unique and wonderful combination of beauty and naturalness. Classics … it is eternal! Over the years, fashion and tastes were changeable, but this certain style – classics has always remained the same! 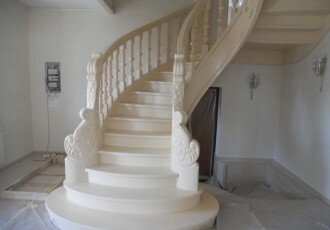 That’s why we offer you classic traditional staircase. Usually, the traditional classic design of stairs includes rich and sophisticated elements. Using this design, you can eliminate almost any element of décor.